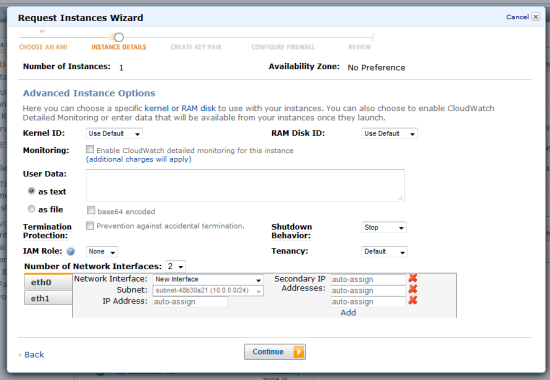 Amazon EC2 instances within a Virtual Private Cloud (VPC) can now have multiple IP addresses. This oft-requested feature builds upon several other parts of AWS including Elastic IP Addresses and Elastic Network Interfaces. Host multiple SSL websites on a single instance. You can install multiple SSL certificates on a single instance, each associated with a distinct IP address. Build network appliances. Network appliances such as firewalls and load balancers generally work best when they have access to multiple IP addresses on a network interface. 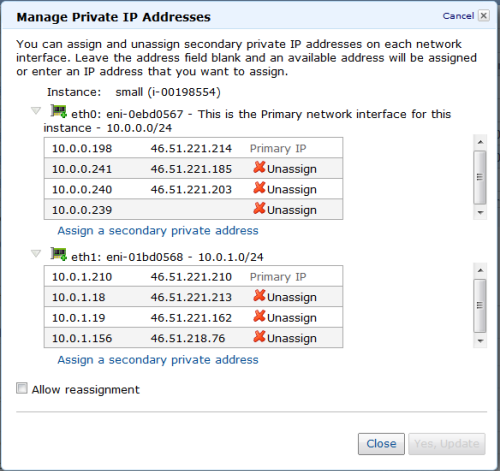 Move private IP addresses between interfaces or instances. Applications that are bound to specific IP addresses can be moved between instances. When we launched the Elastic Network Interface (ENI) feature last December, you were limited to a maximum of two ENI’s per EC2 instance, each with a single IP address. With today’s release we are raising these limits, allowing you to have up to 30 IP addresses per interface and 8 interfaces per instance on the m2.4xl and cc2.8xlarge instances, with proportionally smaller limits for the less powerful instance types. Inspect the limits with care if you plan to use lots of interfaces or IP addresses and expect to switch between different instance sizes from time to time. When you launch an instance or create an interface, a private IP address is created at the same time. We now refer to this as the “primary private IP address.” Amazingly enough, the other addresses are called “secondary private IP addresses.” Because the IP addresses are assigned to an interface (which is, in turn attached to an EC2 instance), attaching the interface to a new instance will also bring all of the IP addresses (primary and secondary) along for the ride. You can also allocate Elastic IP addresses and associate them with the primary or secondary IP addresses of an interface. Logically enough, the Elastic IP’s also come along for the ride when the interface is attached to a new instance. You will, of course, need to create an Internet Gateway in order to allow Internet traffic into your VPC. In addition to moving interfaces to other instances, you can also move secondary private IP addresses between interfaces or instances. The Elastic IP associated to the secondary private IP will move with the private IP to its new home. As I mentioned when we launched the ENI feature, each ENI has its own MAC Address, Security Groups, and a number of other attributes. With today’s release, these attributes apply to all of the IP addresses associated with the ENI. In order to make use of multiple interfaces and IP addresses, you will need to configure your operating system accordingly. We are planning to publish additional documentation and some scripts to show you how to do this. Code and scripts running on your instance can consult the EC2 instance metadata to ascertain the current ENI and IP address configuration. The number of supported IP addresses varies by instance type. Consult the Elastic Network Interfaces documentation to see how many addresses are supported by the instance types that you use. Depending on your use case, you may also need to configure your EC2 network interfaces to avoid asymetric routing. You can use one Elastic IP Address per instance at no charge (as long as it is mapped to an EC2 instance), as has always been the case. We are reducing the price for Elastic IP Addresses not mapped to running instances to $0.005 (half of a penny) per hour in both EC2 and VPC. Each additional Elastic IP Address on an instance will also cost you $0.005 per hour. We have also changed the billing model for Elastic IP Addresses to prorate usage, so that you’ll be charged for partial hours as appropriate. There is no charge for private IP addresses. I hope that you have some ideas for this important new feature, and that you are able to make good use of it.